This Thunderbolt 3 docking station packs big performance into a compact mini dock, delivering 4K UHD video performance to two DisplayPort monitors simultaneously. 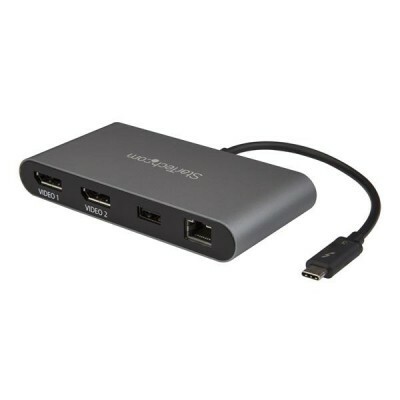 Compatible with macOS and Windows, itâ€™s the ideal accessory for your MacBook Pro, Dell XPS or other Thunderbolt 3 laptop. This mini Thunderbolt 3 dock offers a versatile solution for permanent and shared office workspaces, with a compact design thatâ€™s portable enough to take with your laptop wherever you go. Itâ€™s bus-powered, with no external power required. For flexible setup, the attached USB-C cable has an extended length of 20 cm. The TB3DKM2DP is backed by a StarTech.com 3-year warranty and free lifetime technical support.